The remarks come amid a broader push from the health insurance industry to prevent legislation to enact Medicare-for-all from getting off the ground, including by trying to direct Democrats toward more centrist efforts and reject plans that would effectively legislate many of the companies out of existence. Wary of bringing unwanted political controversy to their companies, some private health-care firms have in part relied on advocacy groups and lobbyists in their fight against Medicare-for-all — joining the push without leaving too many company-specific fingerprints. So, a stealth campaign relying on high-priced lobbyists handing out bribes to "direct Democrats" away from M4A. This represents third-world levels of corruption. AOC is right: We need to primary these people. I think Sanders and others have been deploying well-honed counterarguments to these tired and unimaginative attacks we have been hearing from the industry since the late 1940s. Bernie has my vote. Anyone can say they are for progressive ideas. Actions speak louder than words. Give me someone who has actually fought for these ideas. Bernie has earned my vote. Nate Silver: Bernie raised 300k per day following announcement. That’s 100k more than Beto. Basically, this is taking into account how the candidate fared outside "Day One boost", which is when Beto got basically all of his money. (6.1million out of 9million, compared to Bernie's 5.9million out of 18million). So Bernie's keeping up the momentum much better, and his supporters seem more dedicated. "This video is profoundly moving. It’s more meaningful than people probably realize. I don’t even think Senator Sanders and the media team that produced it realize how special it is. There's a story in the final images that’s not immediately discernible, and it’s quite poetic. Only a few of us who were at the rally on Sunday in San Francisco are aware of it, so I feel like I should share it. The woman who appears in the final scene of this video with Bernie is no ordinary token hijabi. This is our dear sister Dr. Suzanne Barakat. For those of you who don't know her story, Suzanne's younger brother Deah, his wife Yusor whom he had newly married, and his wife’s sister Razan were executed in their home in Chapel Hill, North Carolina four years ago by their white nationalist neighbor. It was a tragic Islamophobic hate crime that devastated her family and shook our community to the core. This encounter between Suzanne and Bernie wasn't planned. We were sitting in the ADA section next to the stage at the end of what was a wonderfully uplifting rally when we noticed the senator coming around the front to greet supporters after he had descended from the podium. A few of us from our group rushed up to meet him and thank him for his kind words in support of our community. Suzanne didn't get a chance to share her story with the Senator in that fleeting moment, just a heartfelt thank you, a smile, and the sweetness of her son, which he received warmly. He didn’t know who she was, nor did anyone from his media team. Our friend Basim Elkarra managed to capture the loving moment in a few photos on his cell phone. We huddled around his phone afterwards in amazement. It turned out Basim had some mad iPhone photography skills. We couldn’t get over how stunning his shots were. The images Basim took stayed with me well after the event. These weren’t ordinary photos—something about them felt iconic. As I was driving home, I recalled the stories Senator Sanders shared publicly for the first time when he launched his campaign a few weeks ago at his rally in Brooklyn, New York—stories about his experience with anti-semitism, about his family’s history with the holocaust, about his relatives who were killed by Hitler’s men. And I thought about the parallels with Suzanne’s story. There was so much shared experience in those photos. So much pain. So much resilience. So much love. And there was something particularly poignant about the life and innocence of her little boy amid the hate and senseless violence that marked the stories his elders carried with them in these images, stories he’d one day inherit. I connected with Suzanne over the phone later that night and shared some of these thoughts with her. The meanings I saw in the photos had not been lost on her either. I suggested she share the photos on Facebook along with a reflection on the connection she shared with Senator Sanders, believing it could have an impact. The timing seemed appropriate, in light of the recent tragedy in New Zealand. It’s not that she didn’t want to, she said, but that she was struggling with her loss, and it was hard for her talk about; the Christchurch shootings had conjured up the trauma for her again. She was going to give it some thought. This was Sunday evening. Then, Monday afternoon, I was scrolling through my timeline when, to my surprise, I saw this video on a friend’s page with Suzanne’s image. We had no idea she was being filmed. The video highlights the exact connections between Suzanne’s story and the Senator’s that we were contemplating. The video editors closed the film with her and her son, not knowing their family were victims of the very bigotry and Islamophobic violence Bernie speaks out against throughout the footage. They probably just thought it was a good shot of the Senator with a hijabi. They couldn’t have known how poignant it was to end the video with her. Three generations. Two different faith traditions. One common humanity, as Bernie said. Thank you, Senator Sanders, for your empathy and compassion and loving, moral leadership. Registered Nurses Have Higher Rates Of Injury Than Construction Workers! Then They Lose Their Health Insurance! Medicare For All! Donate To Bernie! the patients that they are required to lift , move and prevent from falling can be 6 ft and 250-350 lbs "Nursing has the highest rate of nonfatal occupational injuries, according to the U.S. Bureau of Labor Statistics. … Beyond physical injuries, nurses are also susceptible to emotional damage — 82 percent of nurses surveyed in the ANA Health Risk Appraisal said they had a significant risk for workplace stress.May 12, 2016"
Beto is in. Lets see if we can raise more money for Bernie in the next 24 hours than Beto. 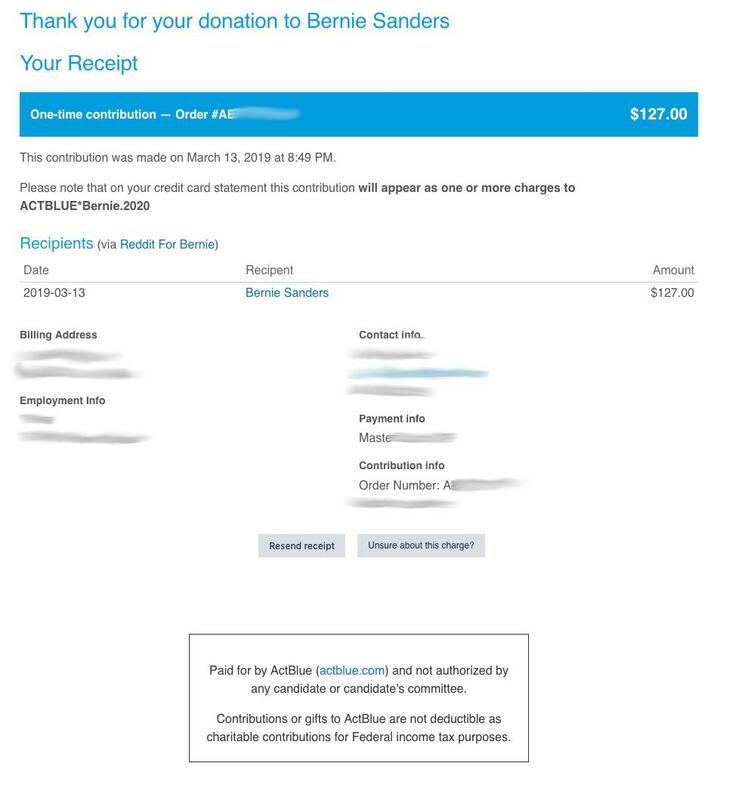 As promised here is my $127 donation. Friendly reminder that more Clinton voters voted for McCain in 2008, than Sanders voters voted for Trump in 2016. Call out our center/right moderates for dishonest criticism of our candidate!